This latest installment in my multicultural folktale series is near to my heart. My penchant for the Norse mythology and folklore rises from my own Swedish ancestry. 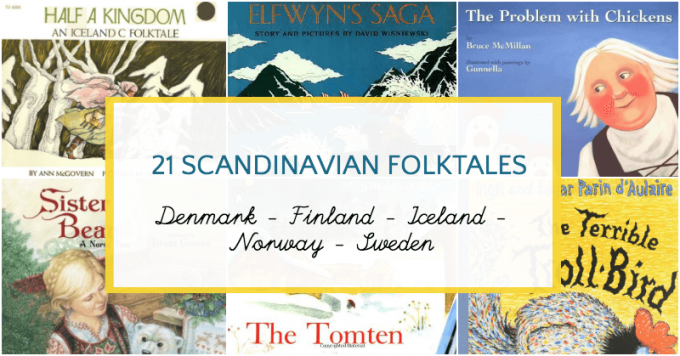 I’m particularly fond of this book list because sharing Scandinavian folktales and folklore is one way I can share the culture of my grandparents down to my kids. Myths and legends from the Nordic countries of Norway, Iceland, Sweden, Finland and Denmark have the advantage of being less well known than the fairy tales of Grimm and Perrault. Many of them will be new to you, yet the themes are familiar. I’ve included picture books of single stories as well as several heavily illustrated anthology collections of Swedish and Norwegian folktales. You’d find plenty of trolls, snow covered landscapes and magical creatures to entertain you. (Note: Affiliate links included below.) … and if your taste runs towards the Swedish tales be sure to visit my list of Swedish Christmas Picture Books. Nail Soup by Eric Maddern, illustrated by Paul Hess. Nail Soup is the Swedish version of the folktale more commonly know as “Stone Soup”. In this story, a weary traveller finds himself stopping at the house of a woman. She is reluctant to offer him a place to sleep but his conversational skills win her over and she finds herself supplying the ingredients for soup made from a nail. I absolutely loved the twist at the end when the traveller leaves, thinking he has tricked a foolish woman into believing he made soup out of a nail, but her final declaration indicates that she knew what was happening all along. Instead, what she realized was the value of friendship — a great lesson for our kids. Astrid Lindgren’s The Tomten by Astrid Lindgren, illustrated by Harald Wiber. This book should be required reading for every child, especially at Christmas. The Tomten takes care of the farm animals at night in the winter, wishing them goodnight and making sure that they are fed. I wouldn’t call Lindgren’s story a folktale, but tomte are mythological creatures found in Scandinavian folk stories and if your kids are put off by all the vulgar trolls in most of these books, read them this gentle tale. 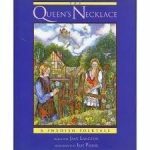 The Queen’s Necklace: A Swedish Folktale by Jane Langton, illustrated by Ilse Plume. An evil king marries, Blanzeflor, a beautiful and kind peasant girl. He gives her a pearl necklace and warns her never to take it off, on pain of her life. But Blanzeflor gives the pearls away, one by one, to the desperate peasants, bringing down the king’s wrath. Her kindness moves the birds who descend from the skies to save her. 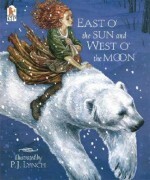 I find East O’ the Sun and West O’ the Moon by by Naomi Lewis, illustrated by P.J. Lynch one of the most intriguing fairytales to come out of Norway. There are several illustrated versions; I like this one with illustrations by P.J. Lynch. You can also read it free online (see Norwegian Folktales below, under collections). A girl saves her family by going to the North to live with a polar bear who is really a bewitched prince. When she accidentally triggers a spell that binds him to the trolls she must set out to rescue him from the land that is east of the sun and west of the moon. There are some great novel versions of this story and I wrote about my favorites in this list of middle grade books I read. Sister Bear: A Norse Tale by Jane Yolen, illustrated by Linda Graves. The traditional version of this tale boasts a male protagonist, but Yolen has adapted it with a girl hero. Halva finds a polar bear cub and naming it Sister Bear, brings it home to her family. Sister Bear brings food back to the family and also likes to dance to Halva’s flute. One evening Halva and Sister Bear request shelter in a house on their journey to Denmark. Their host, however, fears the trolls which come and ransack the place. Halva and Sister Bear are not frightened and trick the trolls into leaving the place alone. Lina Graves’ illustrations are lovely. Also available as an ebook. There are a lot of picture books based on The Three Billy Goats Gruff about three goats who outwit the troll who wants to eat them up. Trolls, of course, are a frequent feature in Scandinavian lore. These are my two favorites versions of the tale. The first is illustrated by the great Marcia Brown, whose version of Cinderella I also adore. The Galdone version is the one you will most likely find at your library. It was the star book of the week at my son’s kindergarten and he was obsessed with the story for weeks. Galdone’s is available as an ebook. The Terrible Troll-Bird by Ingri d’Aulaire and Edgar d’Aulaire. At first my younger son liked this story and requested it several times, but then he decided it was scary. I must say that troll-bird does look a bit menacing but I do like the story and a menacing chicken does have a high silliness factor. When a troll-bird threatens the village, Ola shoots it with his blunderbuss and after some wrangling they manage to bring it back to the village where its now roasted carcass feeds the whole valley at a merry feast. Unfortunately, two overgrown trolls are not happy about these events and storm the village. Not to worry, the sun comes out to ensure a happy ending. 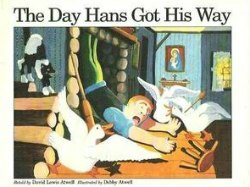 The Day Got Hans His Way by David Lewis Atwell, illustrated by Debby Atwell. Hans complains that his work is so much harder than his wife’s work. So the wife, being the intelligent creature that she is, switches with him for a day. Well, Hans soon learns his lesson. Great fun and maybe parents can suggest that their kids take over their jobs, hee hee hee. The Problem With Chickens by Bruce McMillan, illustrated by Gunnella. This is an original story, rather than a traditional folktale, but it reads very much like folklore. A group of ladies buy a flock of chickens but notice that the chickens start to act like the ladies! They also stop laying eggs. So the ladies come up with a plan to make the chickens act like chickens again — with some amusing results. I really love Gunnella’s illustrations. They have a lovely folk painting flair and although I’ve never been to Iceland (only drooled over it in travel magazines) there is a wonderful sense of the landscape. Also available as an ebook. Half a Kingdom: An Icelandic Folktale by Ann McGovern, illustrated by Nola Langner. One of the things I like best about traditional stories is that they often include strong women. In this old tale, a prince is captured by trolls but and it is up to a peasant girl to save him with her own brand of practicality and cleverness. Elfwyn’s Saga by David Wisniewski is sadly out of print but I was finally able to track one down through interlibrary loan and it is worth the extra effort. This is an original tale, but based on Icelandic lore about the origins of the Northern Lights. Elfwyn, a daughter of a Viking warrior, and blind from birth is the heroine of this story. When the other villagers are put under a spell by a troll’s crystal, only Elfwyn is immune. Fat Cat: A Danish Folktale by Margaret Read MacDonald, illustrated by Julie Paschkis. Honestly, I found this to be one of the weirdest stories ever, but my 5 year old loved it! A mouse lives with a very hungry cat. The hungry cat goes about eating everyone: a woman, soldiers, an elephant… declaring he’s “meow, meow FAT!” and a “HUNGRY HUNGRY CAT!”, until he is enormous. The mouse (now inside the cat’s tummy) snips open his stomach, lets everyone out and sews the cat up. He is now “meow meow FLAT!” and an “EMPTY EMPTY CAT!” Kids will love chiming in with the cat during this fun read aloud. The Ugly Duckling by HC Andersson, illustrated by Jerry Pickney. Hans Christian Andersson fairy tales are original, rather than ancient stories and are lots of illustrated version of his tales so you won’t have trouble finding any at your library. Pickney’s illustrations of an ugly ducking who grows up to be a beautiful swan are gorgeous. Some might be disturbed by the killing of the ducks but most folklore is a bit gruesome, isn’t it? The Princess Mouse: A Tale of Finland by Aaron Shepard, illustrated by Leonid Gore. When it is time to marry, two brothers each cut down a tree. The way the tree lies determines the direction of their future bride’s house. The younger brother’s tree points to the forest. He walks into the forest, but all he finds is a mouse. Of course his older brother mocks him for bringing home a mouse for a bride but what happens next is magical. 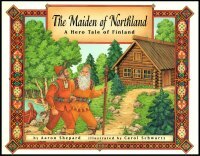 The Maiden of Northland: A Hero Tale of Finland by Aaron Shepard, illustrated by Carol Schwartz. This is a picture book retelling of Finland’s epic saga, The Kalevala. Gorgeous illustrations and readable free verse make this story of the hero Vainamoinen and his quest to marry the Northern Maiden accessible to kids. Norwegian Folktales by Peter Christen Asbjørnsen, and Jørgen Moe. Several of the above single titles are based on stories from this classic collection and free digital versions of it are available at Project Gutenberg. The first English translation was published in 1888. The two authors, Peter Christen Asbjørnsen and Jørgen Moe were sort of a Swedish version of the Brothers Grimm, collecting tales from their Norwegian neighbors in villages across the country. Expect lots and lots of trolls. Also available as an ebook. D’Aulaires’ Book of Norse Myths and D’Aulaires’ Book of Trolls may be the best known collections of Nordic folklore here in the States. We’ve been slowly reading through the Book of Norse Myths and every time I read a story from it my 5 year old talks about it for days. He wants to make sure he has all the important characters sorted out (as in Greek Mythology, all the figures seem to be related to everybody else) and understands all the different worlds (there are nine). Swedish Folk Tales illustrated by John Bauer, translated by Holger Lundburgh. This is a collection of folk tales written by a various Swedish authors, including Elsa Beskow and Anna Wahlenberg. John Bauer’s magnificent illustrations make this collection extremely appealing. They are truly magical, in the style of great fairy tale artists like Arthur Rackham. The stories are of varying lengths and there are some nice short ones when you want a quick dose of troll. The Troll With no Heart in His Body by Lise Lunge-Larsen, illustrated by Betsy Bowen. Although this list has probably supplied you with enough trolls to last you a lifetime, I want to draw your attention to one last selection which I think is worth searching out because of its wonderful illustrations designed from woodcut prints. It also has a nice introduction explaining common motifs in mythology and what we can learn from reading these ancient tales. Also available as an ebook. I have to recommend one of my favorites to this fab list you have assembled: Race of the Birkebeiners by Lise Lunge-Larsen and illustrated with gorgeous woodcuts by Mary Azarian (Snowflake Bentley). I read about that book but wasn’t able to get it by the time I wrote this list. It’s based on a true story, I believe? I’m looking forward to finding a copy of it. I love the woodcuts in her troll book. What a fun movie that is. AM I A FAN????????? HECK YES!! oh this list is epic. so great!!!! and so many favs as well as new ones for me to explore with my daughter! thank you for this. this is going right quick on my friday cool stuff list. Fabulous! I am so glad you have shared these! I love sharing stories from other cultures with my kiddos, and these lists are fantastic! Thanks so much! Looks like great read alouds too.. we read troll bread recently and had so much fun with it 🙂 Thanks for sharing this list on Kidlit Bloghop! Another FANTASTIC list! My husband loves Norse mythology and folklore, so I definitely need to get my hands on a few of these. Thanks for linking up to the Kid Lit Blog Hop! I never realized that the Three Billy Goats Gruff were Scadanavian folk tales! Thanks so much for the link at the Kid Lit Blog Hop! I had never thought about it, either, until I made this list. It makes sense, though, because of the troll. Thank you for this list! I just found your site today, and saw a reference to a visit from Mormor, and knew you had a Swedish connection! I’m currently living in Sweden on our second 5 month stint. The biggest packing challenge this time was what to bring for my 7 year old son, who became a voracious reader over the Summer. I did buy (and lug) The Book of Norse Mythology and he loved it! We read an Icedandic folk tale that sounds similar to the Danish Fat Cat story, but with a girl who eats everything. Have you or your sons read many of Astrid Lingrid’s books? We loved Pippi, and my son tore through The Robber’s Daughter, but Lionheart was too intense for him. Tack så mycket! I’m a little jealous of you — living in Sweden — I dream of living there, I love the country so much! We love Astrid Lindgren! Especially Emil, Lotta and the Children of Noisy Village! I recently read My Son, Mio, a book I’d never heard of before. It was so different than her other books. Thank for for the suggestion! I’ll see if I can find it. I’m wondering if you have ever come across more Icelandic folklore, either for children or adults. I would love to find some but have been unable to locate any. Do you have any recommendations? Thank you! There is a book, Flumbra, Half a kingdom; an Icelandic folktale, Half a kingdom; an Icelandic folktale, but I have not had a chance to read any of them. I work at a fairy tale and folklore website, and I found your blog post really informative. I’m always collecting books of folklore from all over the world, and now I have a few new books to add to my collection! Also, if you’re looking for more Scandinavian tales (or other culture’s tales), I invite you to check out Fairytalez.com – it’s ad-free and designed to give children and adults easy reading of over 2k tales. For instance, The Princess Mouse is from a Finnish folklore collection by Parker Filmore, and the original tale is The Forest Bride: The Story of a Little Mouse Who Was a Princess. There’s several other tales in the collection that are just as fun. Odd and the Frost Giants, and Finn Family Moomintrolls are really good reads for slightly older kids. I really love the Troll book we read it over and over when my son was little. We love those books! I have them on other lists, but they are excellent choices. Thanks for chiming in.